Most of my readers here are mothers. Most of the time when you become pregnant and then give birth you can experience some leakage. Although I've now had 3 children and don't have this issue, my mother always suffered. She would sneeze or cough and leak almost every time. She wore a pad almost every day because of this, but those can be uncomfortable, noisy an messy. With Depend® underwear you can avoid all of that and still be fully protected. 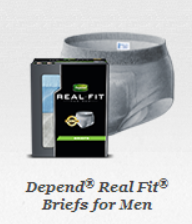 Depend® Real Fit for Men and Silhouette for Women briefs: Look, fit and feel like real underwear and feature a cloth-like fabric for a sleek, ultra-smooth fit. Depend® Underwear with Fit-Flex protection: Features more Lycra stands for a smooth and comfortable close-to-the-body fit. 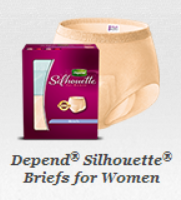 Depend® has many different styles for both women and men. Styles that are more discreet and then your standard styles that have more coverage. They feature cotton like fabric, all around leg elastics and worry free odor control. Now I had my children young and that might contribute to my tight muscles still, but for one day I'm ever not so lucky I will turn to Depend® as they're easy and not quite as messy. For those that aren't so lucky and I know men and women suffer from this. You can practice your Kegel Exercises for help. You can do these discreetly without anybody even noticing and they really do help strengthen those weak muscles. Many thanks to Depend® for sponsoring today’s story and encouraging people to #dropyourpants for #underwareness.